For years Bryon Schroeder heard rumors of an abandoned ancient village in central Wyoming where archaeologists found tens of thousands of artifacts then moved on before fully excavating the site. The site, first discovered in 1969 in the Shirley Basin, became almost mythical. When Schroeder started asking about where exactly it was located and what was found there, no one could remember. When he finally discovered the location and visited in 2010, he didn’t know what to expect. What he found astounded him, and the results of his research could change how we think about the people who lived in Wyoming thousands of years ago. “The mountains are really hot right now, but we don’t know what’s going on down in the basins at the same time,” he said, referring to interest and research among archaeologists. Schroeder believes the Shirley Basin site could be connected to ancient villages recently discovered in the Wind River Mountains. The villagers may have spent the summers in the high alpine and the rest of the year in the basin. In 2005 and 2006 Schroeder, a graduate student at the University of Wyoming, worked in the Wind River Mountains on recently discovered high alpine villages where it looked like communities of ancient people spent time during the summer. When he came across a brief mention of the village in the basin in his research, he was intrigued. 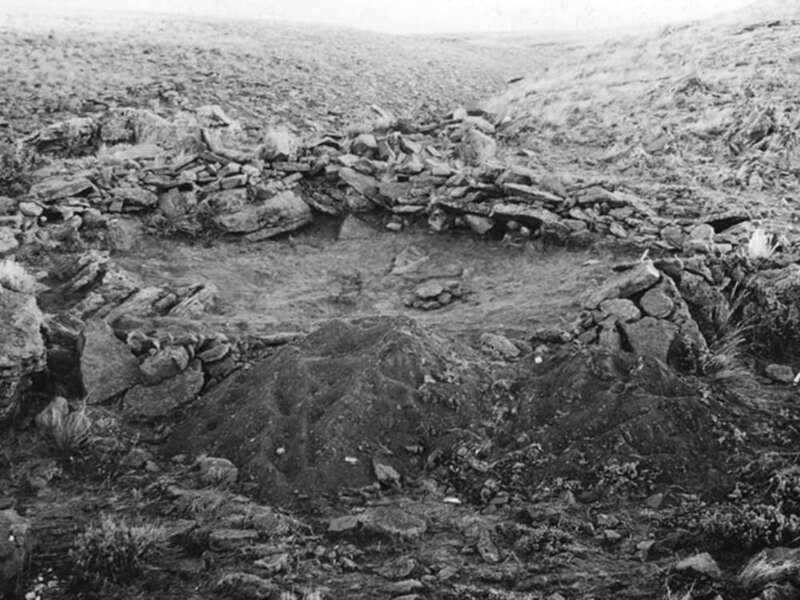 After its discovery in 1969, 21 dwelling sites were excavated, and the site was abandoned. Schroeder said he doesn’t know why, but during that period archaeologists were making discoveries all over Wyoming that were even older, and likely thought to be more important. Approximately 50,000 artifacts were discovered and logged, which Schroeder viewed at the University of Wyoming. When Schroeder saw the collection he noticed something unusual. The way the artifacts were found showed different structures were used for different activities. What he saw differed from how hunter-gatherer societies worked. Hunter-gatherer societies are egalitarian — everyone does a little bit of everything and no one is specialized. The logged artifacts showed specialization. Certain tools were only found in certain dwellings. It further intrigued Schroeder. 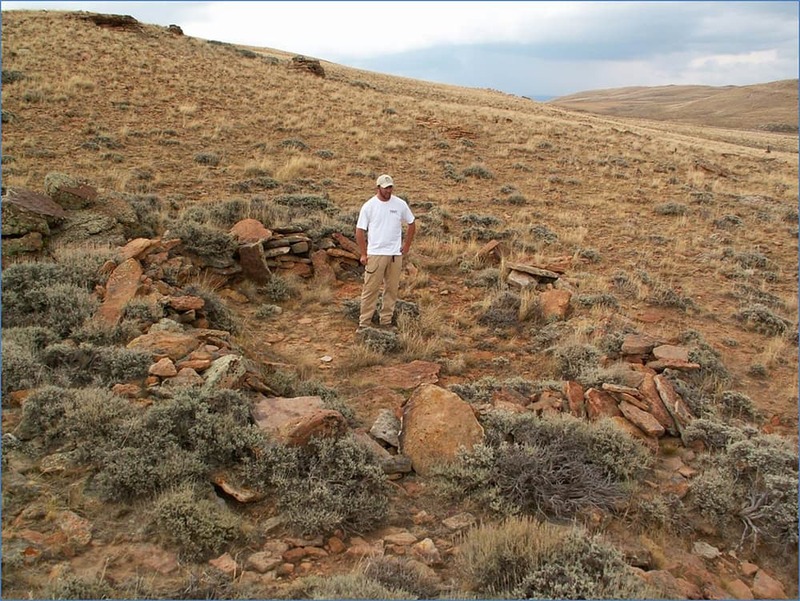 When Schroeder, now a doctorate student in archaeology at the University of Montana, arrived at the Shirley Basin site, he saw the 21 large rock-walled structures documented from the early excavation. But that was just the start. 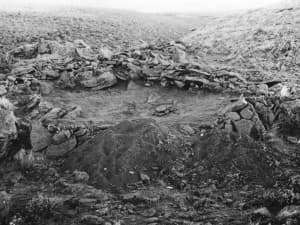 His exploration led him to find remnants of 75 structures including tepee rings spread out across six miles. Schroeder determined the age of projectile points found at the site, dating the people who used them from living 9,000 years ago to within a 1,000 years ago. The core structures, made of rock, are more permanent than homes associated with nomadic people. They are also much larger than most temporary structures. It’s believed people who lived in what is now Wyoming were always moving, but the Shirley Basin site has a feeling of more permanence than a camp, according to Schroeder Perhaps the people who lived there got so good at living in the mountains and using the basins, they were able to slow down and settle, he said. If that is the case — and it is still only a theory, Schroeder emphasized — it would challenge current beliefs about the people who lived in Wyoming thousands of years ago. 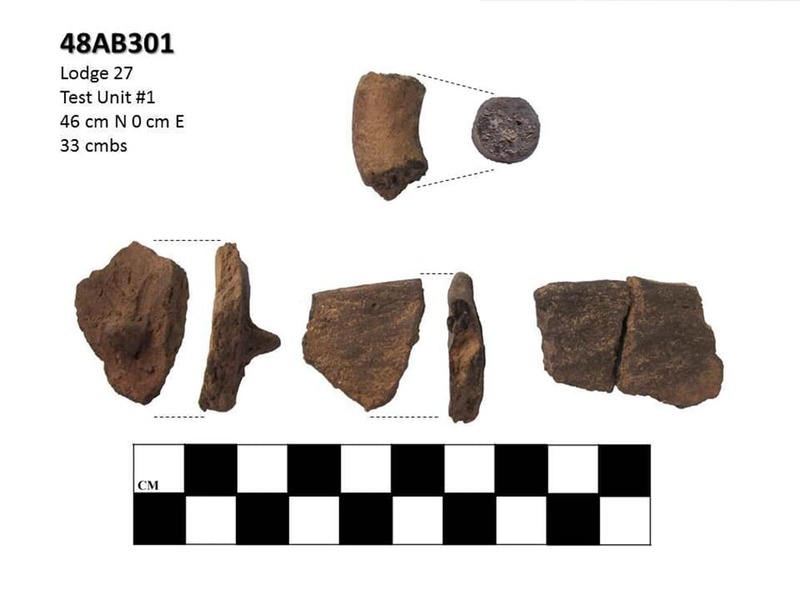 But other findings also suggest the basin was more than a short stop-over spot, and raise new questions about how ancient people interacted with others across the region. The artifacts Schroeder gathered supported what he saw at the university, that people had time to focus on crafts and specific skills, something only possible in more settled communities. While Schroeder didn’t find the shear number of artifacts that were discovered in the dwellings in 1969, he did find several thousand in the structures. They included a large number of giant knives, as well as a lot of smoothed sandstone used to sharpen arrows. He also found a handled jug, a style not normally found in Wyoming, along with several other pottery pieces that look to be from other regions. That may point to some sort of interaction, either travel or trade, with areas hundreds of miles away. There is also obsidian. Obsidian is commonly found at sites throughout Wyoming, usually believed to come from nearby Yellowstone. Obsidian can be sourced. A 2011 study suggested the obsidian that Schroeder found in the Shirley Basin came from New Mexico, a finding congruent with a couple of other Wyoming sites. It’s still unknown how the obsidian made its way to Wyoming. “It’s a pretty cool finding that’s pretty rare,” Schroeder said. A grant from the Wyoming Cultural Trust helped fund Schroeder’s research. His first task was to date the site. 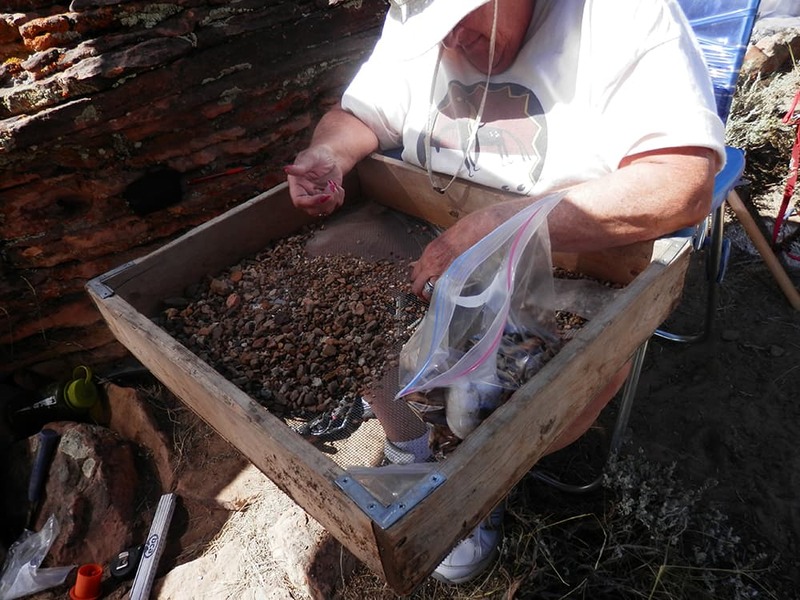 Now he can look deeper at how people used it and what it tells us about some of Wyoming’s earliest people. “There could be a lot of new findings coming out of here,” he said. He plans to apply for another grant to help protect the site and further study it. meaning the people who lived in the Shirley Basin had trade with other people, or traveled. I am neither a student of archeology nor an avid hunter of relics from our past. I do love history. I believe that the more we learn from where we came from the more we’ll know about where we’re going. The people who lived on that Wyoming site had ancestors who had to learn to make stone tools, fire & how to preserve animal skins to stay alive. Those ancient ones were primative compared to the people in the organized town in Wyoming. Study every site. Recover every artifact for display so we can all study our past. Leave no stone unturned. I cannot believe our ancestors would want their future generations to be ignorant of their way of life. My family ancestors we pioneers on one side & Apache Indian on the other. I could never learn enough about where I came from & I believe we should all feel that way. You are right about the townsite move. It was relocated about 6? miles south. As i recall, they found a new deposit of uranium under “the old camp”, as we called it. It was between my 1st and 2nd grade years. 1970. We then had paved streets and sidewalks. We felt like city kids! I lived in Shirley Basin “old camp” and “new camp” from 1963 to 1982, then off and on till 1986. I am against disturbing archaeological sites, for a number of reasons. First, respect the dead, from whatever race, or culture. Thank you for this article! Fresh eyes on an old site have revealed new information. Thank you to the scientist that do this work. There is still so much to learn about our ancient history in Wyoming. The artifacts belong in a public place for all to enjoy and learn from. What’s interesting about this site, and important in the research, it the characteristics that are different than the usual. When you talk about specialization, when you consider the possible size, these speak to cultures that might be different from the Shoshone-based groups we expect to find. South of here were the complex Anasazi cultures, east of here the mound builders. We’ve not entertained cultures that complex in this area previously. It would be pretty amazing if a totally new or related culture was discovered based on research from this site. This is an awesome article. Obsidian is also found over in the Jeffrey City, WY area, so they would not have had to travel too many miles. Thank you for a cool piece. I was born in Casper, WY in 1967. Somewhere between 1969-1971 we lived in Shirley Basin. I have one very vivid memory from living in Shirley Basin. From our living room window, I watched a mobile home burn down. My father went in to help get people out. Sadly, he was only able to help recover babies body. He was able to get out before mobile home collapsed. Cynthia – our family lived in Shirley Basin from about 1968ish to 1970. I believe you are referring to the Luverne (sp) Taylor family. We were living in Hanna by that time. What a tragedy. My sister and I roamed all around the town site. Wish we would have found some of these great artifacts! How can you return the artifact to the Natives who owned them? They died 9000 years ago. Today’s “Native Americans” are no more likely to be descended from them than anyone else living here today. The New Mexico link suggests Folsom or Clovis cultures – which may well have been more closely related to their contemperaneous cultures of France, not North America. In 9000 years, a lot of people come and go. What a refreshingly honest view of archaeological sites and artifacts! “Giving back” relics is absurd but sentimental. As an artifact hunter myself, I love reading about any and all finds. I think it is important to gather the artifacts to study and protect them. If the artifacts are displayed for all to see they can not be destroyed or sold!!! I agree with Delvern, the artifacts should be returned to the Natives who were here long before we were. Perhaps the studies could be conducted like they are now in many other ancient sites: the surface and layers are scanned while not disturbing the contents. Something we should seriously consider. You should return all of the Artifacts . This place that you Re opened should have never been touched, SINCE ,” Approximately 50,000 artifacts were discovered and logged ” In 1969 !! If you wanted to know what was found there you should have gone where the artifacts are kept . There were hundreds of thousands of artifacts in museums of our people throughout this country, I’m sure you all know this ! Archaeology Should only be NEEDED not WANTED !! Example -” If a site is accidently opened ” It’s 2015 how long is going to take the Archaeology world to finally realize that our people have lived on this land and used it FOR A VERY LONG TIME !!!!!!!!!!!! I am glad to hear that this site is being reevaluated after all this time. Now I wish I could be there to learn more about the people and help with the project. This is such fascinating stuff! What a fantastic find, or “re-find”, as it were. It must be very rewarding to be working this site. I wish that a team could work a potential site in Idaho, out on the desert, south of Kilgore. I just know that it had to be a dwelling site, from what’s been found. But your site in Wyoming….wow! 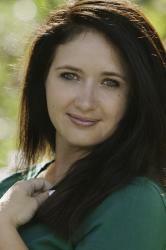 Originaly born in Los Angeles, California and fascinated with history. Also enjoy finding out about my family history.